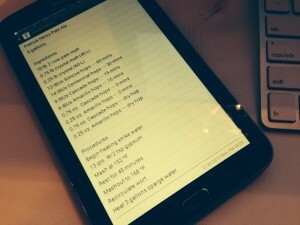 It’s a beer recipe written in the notes program on a tablet computer. It’s like spending $200 for a piece of paper — and you can’t make a paper airplane out of it. A couple days ago, I posted my “brew year’s” resolutions. One of the resolutions was to make a brewing plan (that I would later ignore when I come up with a better one). So . . . here it is, my brewing plan for 2014. I’m starting the countdown clock for when I deviate this . . . now. 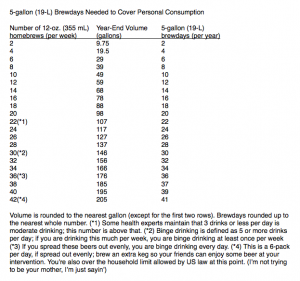 How often you would need to brew 5 gallons (19 L) of beer to cover your own personal level of beer consumption for a year. Click the chart to enlarge. Around this time of year, people make resolutions — often to brew more — and perhaps even draw up a brewing plan for the coming year. 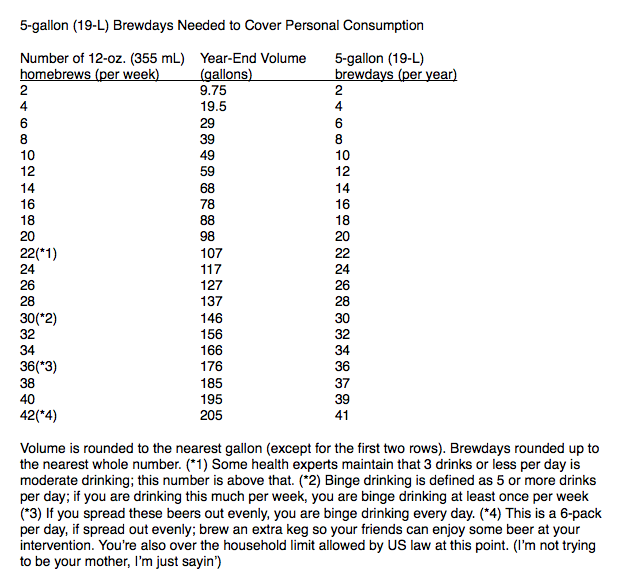 If you’re wondering, “How often should I brew this year?,” there are a couple ways to look at it. The easiest answer is, of course, brew as often as possible — it’s your hobby, enjoy it to the fullest. A slightly nerdier way of looking at the question would involve planning your number of brew days to meet your anticipated beer needs. Brewing generates beer, of course. At the end of the year, it’s possible to have brewed either too little beer or too much beer (if you accept that there is such a thing). Hitting the sweet spot between these two outcomes — having brewed exactly the right amount of beer — can be accomplished with a little planning and dedication. Here’s how you plan for it.